A couple of days ago, I took an autorickshaw back home and the meter showed a fare of INR 46, I gave the driver a INR 50 note and walked away without taking back the change. It was like an unwritten code that any change below INR 5 will not be asked! That's when I suddenly thought how the value attached to spending INR 5 has become close to negligible (excluding the BPL families), and the main factor for this being the introduction of the 5 rupee coin. So today a 5 rupee coin is spent and kept on par with what a 1 rupee coin was about 5-6years ago. Hence there has been an increase in the spending pattern of the consumers (one may attribute this to many other economic and societal reasons too). Roughly about a week ago, I was sitting in this coffee shop with a friend, and just as we finished paying the bill and when we were taking back the change I noticed that we had got a new looking coin. It was the new 10rupee coin which was released earlier this year and was also India's first bi-metallic coin. I pondered for a few minutes and I was pretty sure with the way of life changing ever so rapidly (a lot faster than it was 5-6years ago) the new 10rupee coin will gain acceptance and occupy the place of the 5rupee coin more faster than expected. 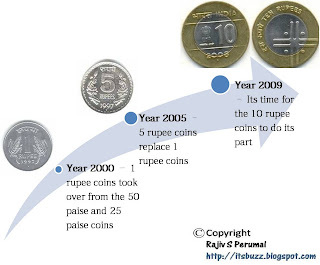 If the 5 rupee coin took 2-3years to replace the 1 rupee coin, then I'm sure the 10rupee coin will take only about a year. The long and short of the story is that the introduction of higher value coins and notes are perfect for marketers. Its literally like a boon. The consumers are now tempted to spend more. Marketers need to now focus on making the product offering more attractive and can worry less about changing the mentality of the consumers with respect to spending. Economically the 'Indian middle-class consumer segment' (with its ever increasing spending power) which is already the center of attraction for nearly all the global brands will now start to look even more attractive. Moreover the continuosly created demand by the Indian consumers has played a big role in helping the world out off recession (again there are many reasons in this context, I have taken this one as it pertains to the article) and will also help speeden the recovery path.